A Desert Hot Springs family keeps their ‘streak’ of running intact with participation in upcoming Palm Springs Aerial Tram Road Challenge. (From left) Gary Rust, his son Rusty and wife Veronica run together in preparation for the Palm Springs Aerial Tram Road Challenge Oct. 28. Gary Rust will do just about anything to ensure his place in the U.S. Running Streak Association remains intact. Since 1983, Rust has run at least once a day to ranked 44th in the country with 34.28 consecutive years. The No. 1 ranking belongs to another Californian, Jon Sutherland, whose streak dates back to 1969 or 17,671 consecutive days. The 70-year-old Rust tested the boundaries of maintaining his own streak recently when he was cooped up in a hospital bed following prostate surgery. VIDEO: The Rust Family talks about their passion for running every single day. “Did you …? Was there …?” stammers someone hearing his story for the first time. What drives a man to make running part of his immediate post-op recovery? Streaking does. And Rust is not alone. His wife Veronica, and their teenaged son Yeraj, nicknamed Rusty, are also active streakers. The trio run sometimes together, sometimes each on their own; sometimes early in the morning, sometimes in the last late-night minutes –at least one mile within each calendar day. Rusty, 17, has been running for more than a third of his life: 2,251 days, or 6.1 years, as of early October 2017. His mom’s streak is twice Rusty’s: 4,828 days, or 13.2 years. And the Rusts’ three streaks will continue Oct. 28 when they join more than 1,100 runners and walkers at the Palm Springs Aerial Tram Challenge. 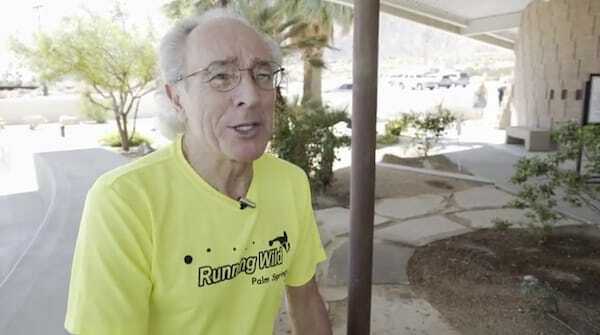 Since 1983, Desert Hot Springs’ Gary Rust has run at least once a day to ranked 44th in the country in the U.S. Running Streak Association with 34.28 consecutive years. As its name warns, the Challenge is a grueling 3.7-mile climb, ascending 2,000 feet of elevation at an average 12 percent grade (16 percent at the top), through Chino Canyon into the San Jacinto Mountains, from the Tramway’s Visitors Center to its base station. The Rusts have run the Challenge several times, and Gary holds three age-group records. But the 2017 race is already guaranteed to be a Rust keepsake, because they are running it in preparation for Rusty joining the Marines in 2018. It might, in other words, be their last chance to streak the Tram as a family.